Hamza Mosque in Al Wakrah. The local population, made up of Qataris, are all Muslims although there are high numbers of foreign workers in Qatar which varies the Muslim population. According to the CIA World Factbook, as of 2010 an estimated 67.7% of the population is Muslim, while 13.8% is Christian, another 13.8% Hindu, and 3.1% Buddhist. Foreign workers are well noted in the country, mainly from South Asia and Americans which constitute most of the population of Qatar. At the end of 2013, there were a total of 1,848 mosques recorded in the country. Islam spread over the entire Arabian region in the 7th century in a string of widespread conflicts resulting in the Islamization of the native Arabian pagans. Muhammad sent his first military envoy, Al-Ala'a Al-Hadrami, to Munzir ibn Sawa Al Tamimi, the ruler of the region of Bahrain, which extended from the coast of Kuwait to the south of Qatar, in the year 628 AD inviting him to accept Islam as he had invited other kingdoms and empires of his time such as Byzantium and Persia. Mundhir, responding to Muhammad, announced his acceptance of Islam, and most of the inhabitants of Qatar became Muslim, heralding the beginning of the Islamic era in Qatar. A traditional mosque in Katara Cultural Village. It is likely that some settled populations in Qatar did not immediately convert to Islam. Isaac of Nineveh, a 7th-century Syriac Christian bishop regarded as a saint in some churches, was born in Qatar. Other notable Christian scholars dating to this period who hailed from Beth Qatraye include Dadisho Qatraya, Gabriel of Qatar and Ahob of Qatar. By the end of the 7th century, however, most of the Christians had either converted to Islam or migrated elsewhere. During Islam's early years, Qatar's inhabitants are thought to have subscribed to the radical Khawarij ideology. During the Second Fitna, a renowned Khariji commander named Qatari ibn al-Fuja'a, who was described as the most popular and powerful Khariji leader, led the Azariqa, a sub-sect of the Khawarij, in to numerous battles. He held the title of Amir al-Mu'minin and ruled over the radical Azariqa movement for more than 10 years. Born in Al Khuwayr in Qatar, he also minted the first known Kharjite coins, the earliest of which dated to 688 or 689. The historic flag flown by Qatar was plain red, in correspondence with the red banner traditionally used by the Kharjite Muslims. Library in Imam Muhammad ibn Abd al-Wahhab Mosque (the State Mosque), Doha. At a tertiary level of education Islamic Studies is taught at Qatar University, and at Hamad Bin Khalifa University’s (HBKU) Faculty of Islamic Studies where a master's degree is offered. Sheikha Moza bint Nasser, the consort of the Father Emir and mother of current Emir, is the most notable graduate. 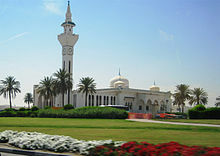 Education City is also home to the Center for Islamic Legislation and Ethics [CILE], a think tank founded in 2012 and headed by Swiss political philosopher Professor Tariq Ramadan, of Oxford University. Islam’s role in scientific discovery has also been an area of interest for the Qatar Foundation, and recently, the Society for Muslim Scientists was established with prominent members. In 2010, the joint venture between Bloomsbury Publishing and Qatar Foundation began, which saw them publish the book, ‘Science in Islam’. Qatar's religious ministry uses the Fanar, Qatar Islamic Cultural Center as an outreach center for Islam. Fanar Culture Center is involved in several social, religious and educational activities. In addition to housing one of the largest mosques in Qatar, the center also publishes religious studies and provides lessons in Arabic and Islam. Among Fanar's facilities is a library with Islamic literature and manuscripts. A typical indoor prayer hall in a Qatari mosque. Sunnis account for the majority of Qatar's Muslim population at upwards of 90%. Most Sunnis adhere to the Salafi interpretation of Islam. The country's state mosque is Imam Muhammad ibn Abd al-Wahhab Mosque, which was named in honor of the Sunni scholar Wahhabi founded Muhammad ibn Abd al-Wahhab. Shiites comprise around 10% of Qatar's Muslim population. Several of Qatar's most notable merchant families have historically been Shia. Qatari Shiites are granted religious liberty and some have held government positions. In contrast to the Shiites in nearby Bahrain, the Qatari Shiites have an identical dress, dialect and culture to Qatari Sunnis. However, there have been a small amount of societal conflicts between Shiites and Sunnis within the country. One notable instance is the attempted demolition of a Shia cemetery near Doha in 2011 by a group of Wahhabi extremists allegedly affiliated with Qatar's Islamic ministry. Upon receiving news of this event, emir Hamad bin Khalifa condemned the attempt and attended a Shia funeral as a sign of respect. ^ "Qatar". The World Factbook. Central Intelligence Agency. Section: People and Society – Religions. Last updated 30 May 2017. Retrieved 9 June 2017. ^ "National Day/ Ministry of Awqaf and Islamic Affairs' Achievements". menafn.com. Qatar News Agency. 12 December 2014. Retrieved 28 December 2015. ^ "History of Qatar". Amiri Diwan. Archived from the original on 22 January 2008. ^ Fromherz, Allen (13 April 2012). Qatar: A Modern History. Georgetown University Press. p. 2041. ISBN 978-1-58901-910-2. ^ "Christianity in the Gulf during the first centuries of Islam" (PDF). Oxford Brookes University. Archived from the original (PDF) on 28 May 2015. Retrieved 14 December 2015. ^ "Qatar". Geographical. 78 (2): 12. February 2006. Retrieved 14 December 2015. ^ Lo, Mbaye (2009). Understanding Muslim Discourse: Language, Tradition, and the Message of Bin Laden. University Press of America. p. 56. ISBN 978-0761847489. ^ Sanbol, Amira (2012). Gulf Women. Bloomsbury UK. p. 42. ISBN 978-1780930435. ^ Complete Flags of the World (Dk). DK Publishing. 2014. p. 185. ISBN 978-1409353713. ^ "Class of 2015 graduates honoured". Gulf Times. 6 May 2015. ^ "CILE Center – about us". CILE. 2012. ^ "Bloomsbury Qatar Foundation publishing and delfina foundation announce winner of Arab writing residency programme". Al Bawaba. 5 March 2015. ^ "Qatar - Country Profile". about.com. Retrieved 5 January 2016. ^ "Qatar embraces Wahhabism to strengthen regional influence". Middle East Online. 18 December 2011. Retrieved 5 January 2016. ^ "Mapping the Global Muslim Population" (PDF). Pew Forum on Religion & Public Life. October 2009. Retrieved 5 December 2015. ^ a b Kamrava, Mehran (26 May 2015). Qatar: Small State, Big Politics (updated version). Cornell University Press. pp. 185–188. ISBN 0801454301. ^ Micahel Stephens (26 November 2012). "Ashura in Qatar". Open Democracy. Retrieved 5 January 2016.